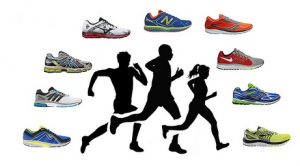 – Olympic sports writer Alan Abrahamson talking about how there’s too much going on at track meets for a casual fan to follow and they need to change in order to become more spectator friendly. 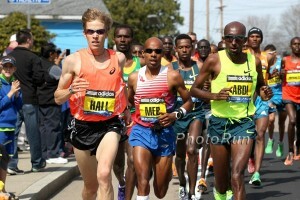 What happened to Aaron Braun at LA Marathon? My Coach to me: "Work as hard as you like, you just don't have good genetics." A Year Ago, GB’s 60m World Indoor Champ Richard Kilty Almost Quit The Sport And Joined The Army And Now He Wants To Become The 2nd White Man To Go Sub-10 Kilty’s life has improved a lot as he’s also had run-ins with the law in the past, including 4 months ago paying a large fine for putting his fist through an estate agent’s window. 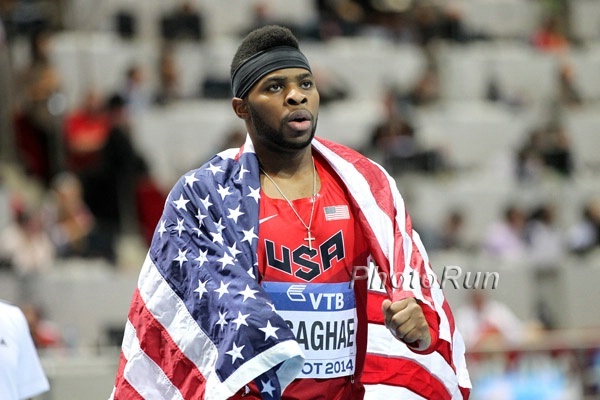 IAAF Profile On US’s Omo Osaghae, Who Won A Surprise 60H Gold At World Indoors Osaghae almost gave up on the indoor season to focus on outdoors as he was dealing with early season injuries. US 4 X 400 Anchor Leg Calvin Smith Carries On Family Tradition As He Breaks WR Smith’s father Calvin Smith Sr. is a former 100m WR holder (9.97). Shelly-Ann Fraser-Pryce Says She Didn’t Do Any Special Training For The 60 She won gold at World Indoors, but says she’s been doing the same training she does for the 100 focusing on outdoors. 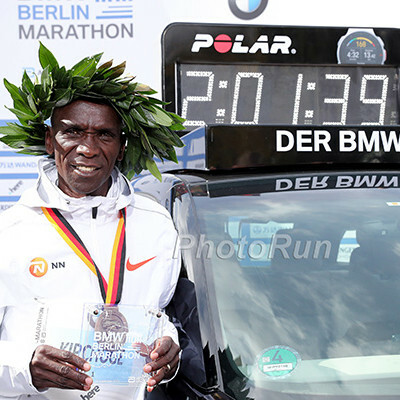 Bernard Lagat at age 39 had a tremendous kick on Sunday, but he met his match in a younger version of himself as Caleb Ndiku was too good the final lap. 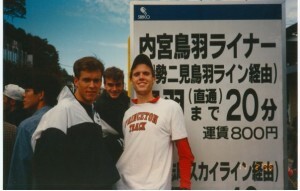 Galen Rupp was a very respectable 4th. 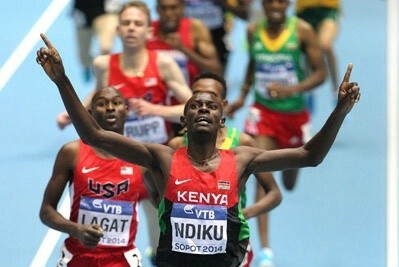 *What was the message on Ndiku’s shirt? 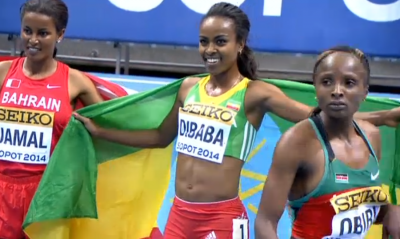 (updated) Genzebe Dibaba dominated to remain undefeated in 2014 (like Mary Cain), defending champ Hellen Obiri got silver, and the Americans weren’t factors. 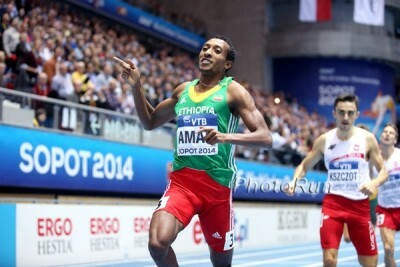 IAAF Final Day Recap: US World Record In X 400, SAFP Wins 60, Yarisley Silva Wins Vault, Barshim Over Ukhov The World Indoor Champs in Poland went out with a bang. Recap of all the final day action. 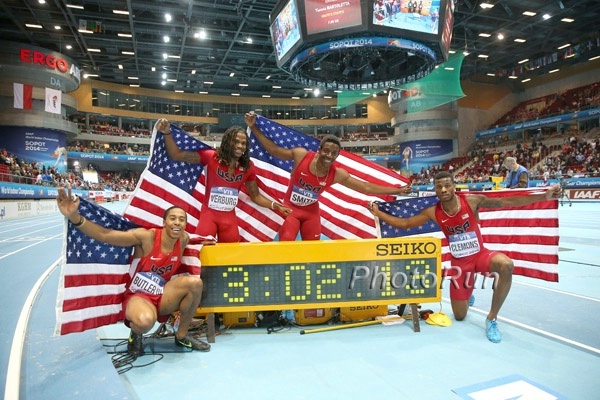 Three More Gold Medals For USA On Day 3, Including A WR In The 4 X 400 The men’s 4 x 400 ran 3:02.13 to set an official WR, although it’s not the fastest time ever run, as a US team that included Jeremy Wariner ran 3:01.96 in 2006, but it wasn’t ratified as there wasn’t drug testing. 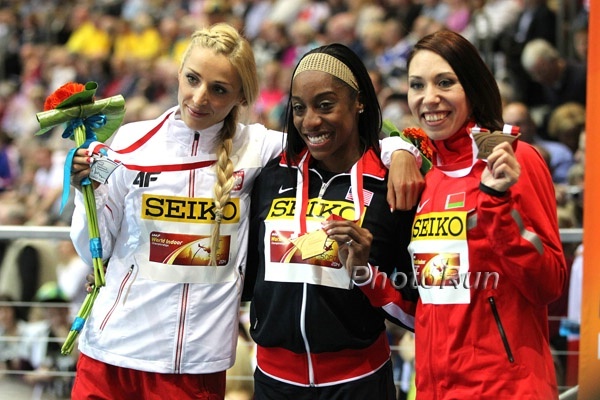 The women’s 4 x 400 also won gold with an AR of 3:24.83 and Omo Osagha won gold in the 60H. 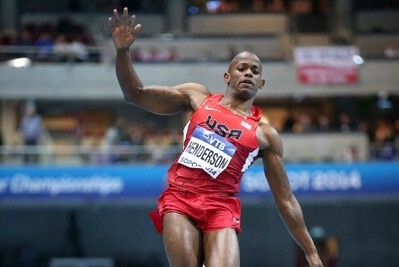 Overall, USA won 12 medals (8 gold) at these championships. Lemons Into Lemonade: UK’s Katarina Johnson-Thompson Wins LJ Silver After Missing Making Worlds In Pentathlon France’s Eloyse Lesueur took gold with 6.85m, beating out Johnson-Thompson’s 6.81m. 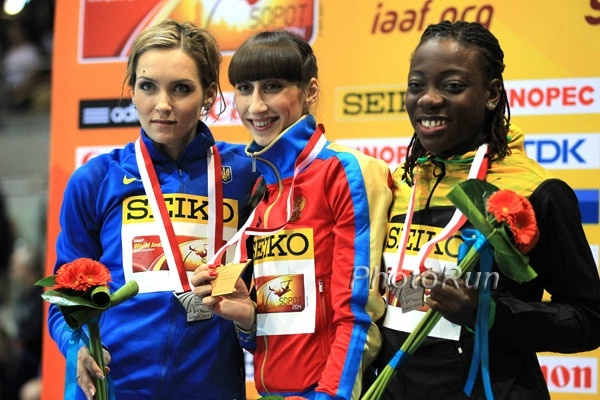 Like Kissing Your Sister: Poland’s Kamila Licwinko And Russia’s Mariya Kuchina Tie For World Indoor HJ Gold Medal They both got 2.00m and tied at 2.02 and since they had equal misses, they tied. 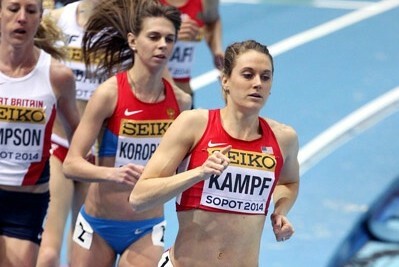 They had an option for a jump off, but both declined. 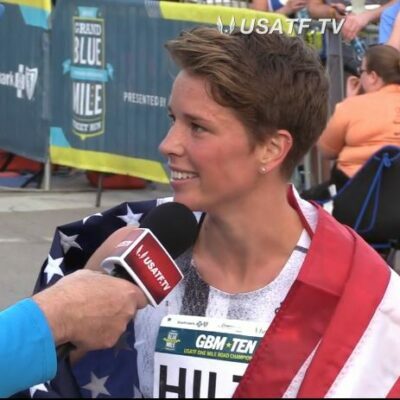 Sara Hall Wins Mountain To Fountain 15K In Arizona In 51:20 Andrew Lemoncello won the men’s race in 45:49 over Nick Hilton (45:56). Full 2014 IC4A Results Cornell won the team title over UConn. Full 2014 ECAC Results It was the opposite of the men’s team scoring as UConn won over Cornell. Florida’s Men And Women Take Over #1 Rankings Ahead Of NCAA Champs Arkansas men and Oregon women both moved down to number 2. 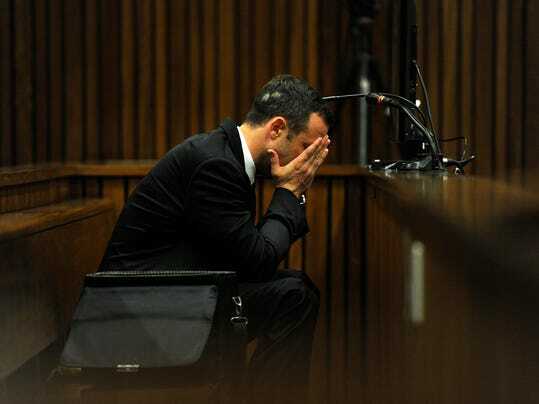 Pistorius’ defense lawyer also produced cell phone records and said the security guard lied and that Pistorius actually called him first that night, not the other way around. 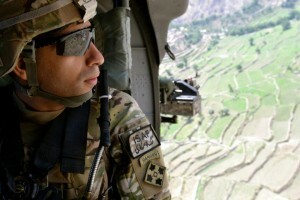 The guard disagreed, but we don’t understand how there is confusion if there are actual cell phone records available. Updated D1 Rankings Predict Close Championships Battles For Men’s And Women’s Team Race Florida men and women lead the rankings over Arkansas men and Oregon women. Deena Kastor To Headline Rock ‘N’ Roll Dallas Half Marathon This will be her first race since the World Champs marathon last summer. 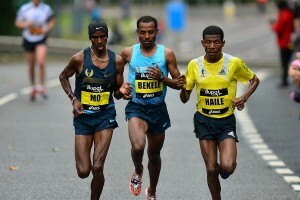 Mo Farah On Verge Of Running Into A Scottish Storm? 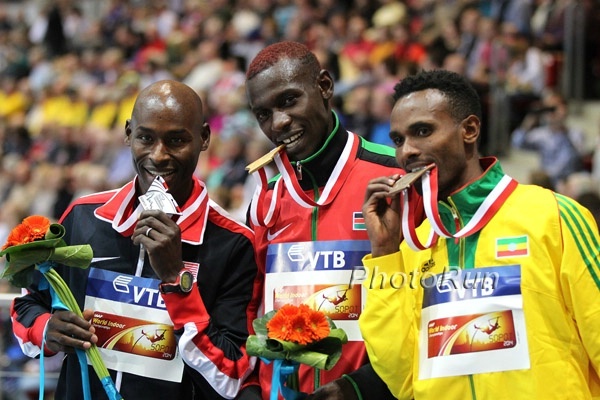 UK Independent article claims Commonwealth Games organizers are furious that Farah might be snubbing their championships, but still running the Glasgow Grand Prix a few weeks before for a big payday. 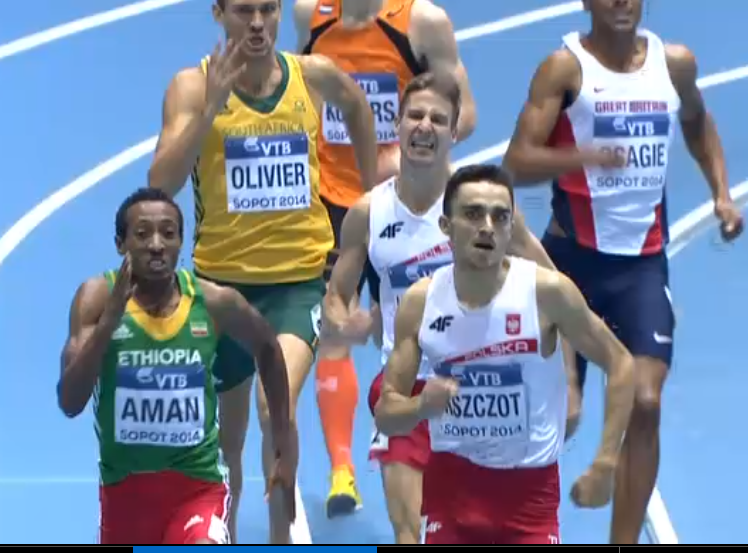 LRCM 1,500 Final: Souleiman Arrives As A Star, Nick Willis Just Misses (And Gets DQ), Leer A Non-Factor, And A Possible Boycott Of USATFs? World, meet the newest mid-d star Ayanleh Souleiman. 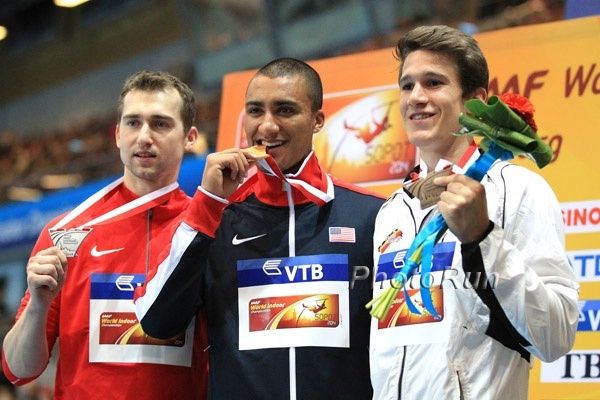 Souleiman controlled the race from start to finish, as Nick Willis came up just short of a medal, Will Leer was a non-factor and talked about a possible boycott of USAs. 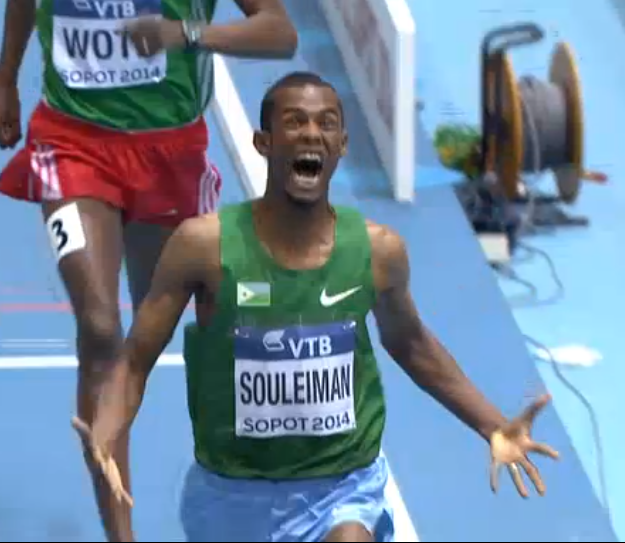 Recap, results, and video and a dance by Souleiman. 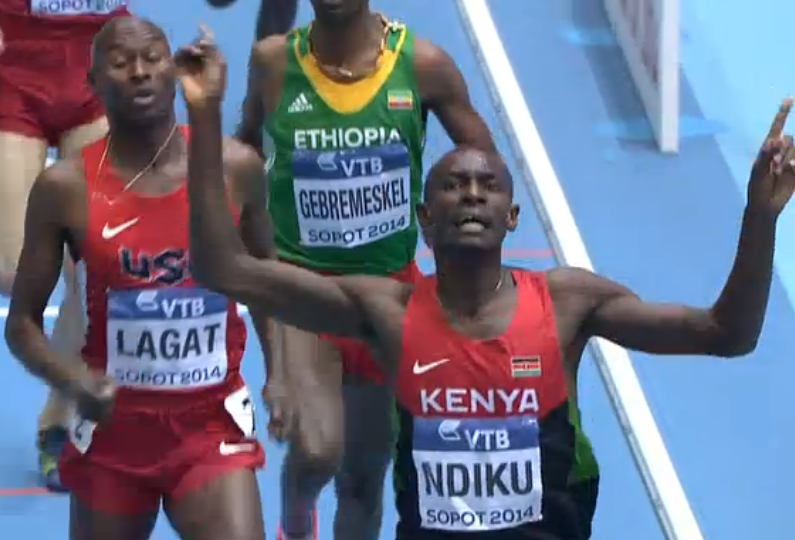 *Kenyan Papers Rip Birgen And Kiplagat: “Birgen scoops wooden spoon in Sopot.” That means last place. 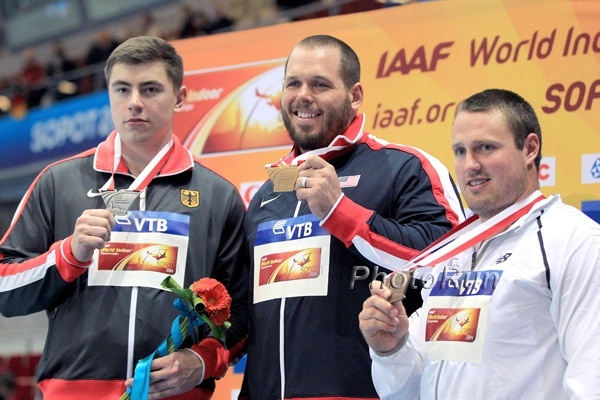 *Abrahamson: Is Winning Gold Ever “Failure”? 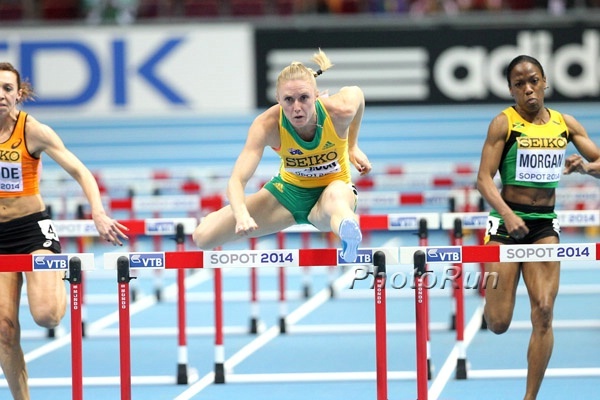 Day 2 IAAF Recap: A Night Of Big Surprises As Sally Pearson Is Beaten Team USA’s Nia Ali pulled a huge upset in the women’s 60H over Sally Pearson, but there were also stunners all over the place. 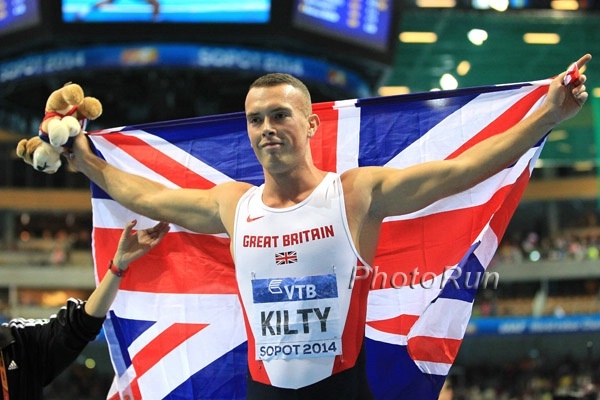 White Guy Richard Kilty – Who Only Came To Worlds As Dasaoulu Was Injured – Wins 60m For GBR He was a 33-1 long shot. 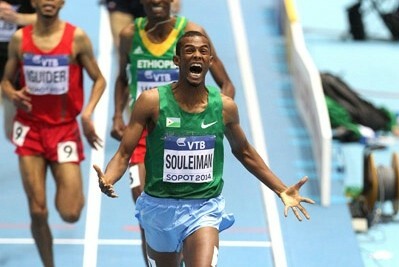 Mauro Vinicius Da Silva Defends Long Jump Title in Dramatic Fashion Da Silva was out of the medals until his final jump when he snatched gold. 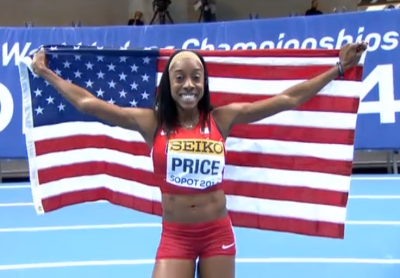 UpdatedCHANELLE PRICE GETS THE GOLD!!!!! 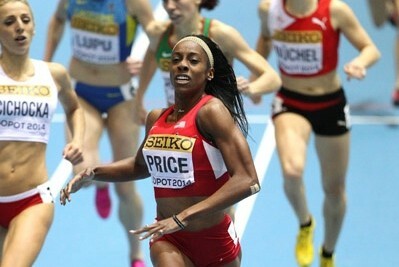 Chanelle Price took it out really hard and hung on to win gold at 800 at the World Indoors. Wire-to-wire, world-leading time for the win. Impressive. Updated with analysis, comments, video interview. On The Boards: *CHANELLE MFin PRICE!!! 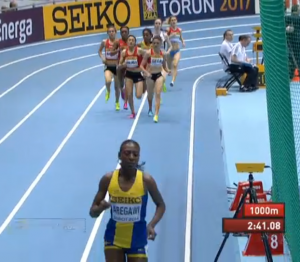 Abeba Aregawi went out and crushed the field. 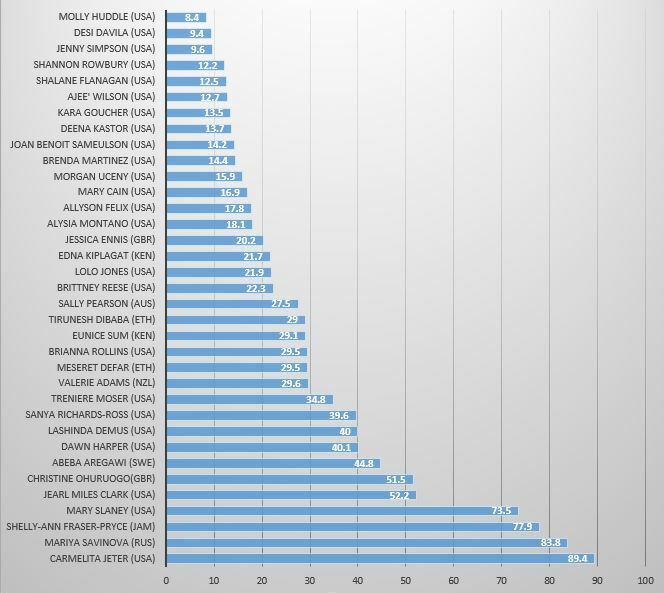 There have now been 3 2 DQs after the race. Moving Canada’s Nicole Sifuentes to bronze and Treniere Moser to 4th 5th. (3rd DQ reversed on appeal). 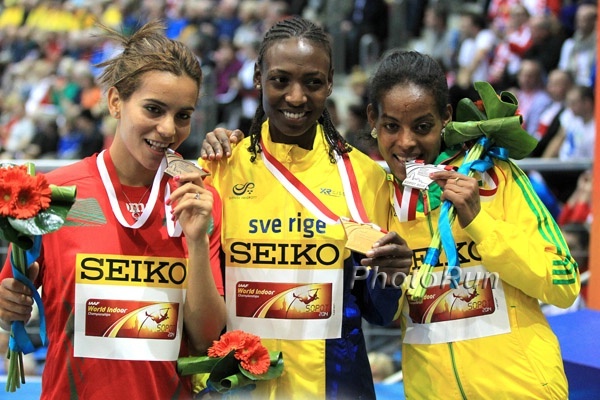 On The Boards: Womens 1500m – 3 DQs – Sifuentes Bronze? 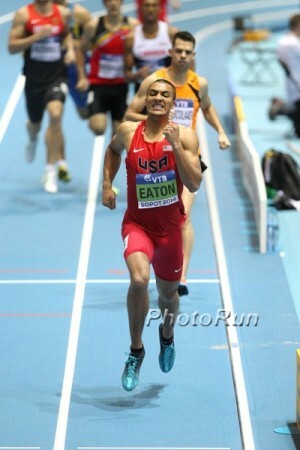 Eaton was ahead of WR pace going into the heptathlon 1000m, but came up a bit short and missed breaking his WR by 14-points. 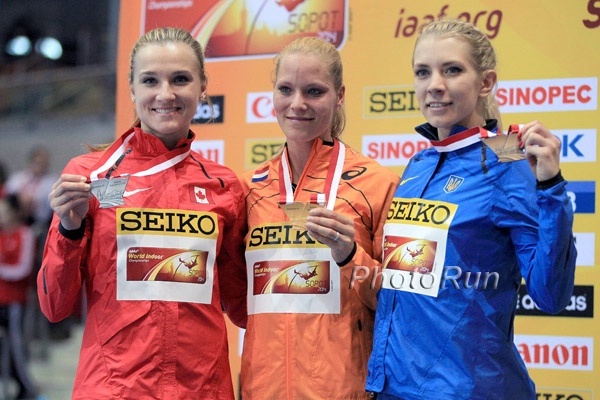 We decided to take this opportunity to talk distance running with Eaton and see what kind of a training a double-multi-event WR holder does. 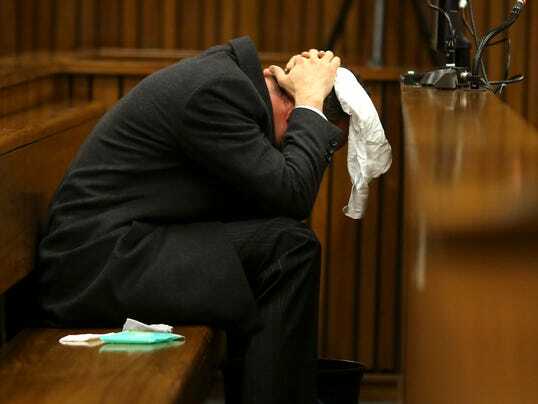 Security Guard Says Oscar Pistorius Lied And Told Him Everything Was Fine After The Gunshots Went Off Things aren’t looking good for Oscar P, who then called back and just started crying. Neighbor Testifies That Pistorius Tried To Revived His Girlfriend After He Shot Her The neighbor arrived on the scene and found Pistorius trying to give her CPR, but she was already dead.